French painter. He made his public dbut in 1756 at the newly opened Marseille Acadmie, where he was listed as a drawing teacher; since nothing is known of his early training, and there is no record of his attempting to enrol at the Acadmie Royale or to win the Prix de Rome , it seems likely that he studied outside Paris. He did, however, exhibit regularly at the Paris Salon from 1767 to 1783, and he was accepted (agr) by the Acadmie Royale in 1766 and received (reu) in 1771, submitting the painting on which his fame was almost entirely to rest, the Oath of Brutus to Avenge Lucretia (exhibited Salon 1771; Nevers, Muse Municipal). This work played a central role in the development of history painting between the British and French examples of the 1760s and Jacques-Louis David s Oath of the Horatii of 1784 (Paris, Louvre), breaking new ground with its simple, meaningful gestures and architectural setting, although the picturesque costumes and the lack of dramatic focus look back to Rococo taste. 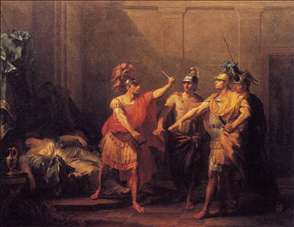 While owing something to Gavin Hamilton s Oath of Brutus of 1762-3 (New Haven,Yale Center of British Art), popularized by Domenico Cunegos engraving of 1768, Beauforts Oath is more virile and direct, emphasizing a heroic resolve to seek revenge and providing David, who drew Beauforts version in his Versailles sketchbook, with the motif of three arms and hands outstretched to take the oath. See more details about "The Oath of Brutus"